Three-month-old Sindrella Okello sleeps safely beneath a mosquito net in Apac, Uganda. To reach the most malarial town on earth, head north from Kampala, cross the Victoria Nile and, just before you come to the refugee camps that mark the southern edge of Uganda's 20-year civil war, turn east to Lake Kwania. Africa's other Great Lakes are known for freshwater beaches and cool evenings, but Kwania is more of a giant swamp: shallow, full of crocodiles and choked with lily, papyrus and hyacinth. The malaria parasite loves it here. Kwania's creeks, looking like a million silver fish bones from the air, are perfect for a deadly subspecies of mosquito, Anopheles funestus, which feeds almost exclusively on humans, with an appetite to shame a vampire. The nearby town of Apac is packed with a living blood bank of people. The average funestus bites human flesh 190 times a night. The average resident is bitten tens of thousands of times a year, including 1,586 bites  four a day  that carry malaria. Driving into Apac late on an August day last year, I saw a naked man lumbering toward me. Tall and thin, he was gray with dust, and his hair bristled with twigs and grass. He was talking to someone only he could see. Edging past, I was surprised by a second naked figure lurching out of a side street. He had the same cracked skin stretched over the same slender frame. Ahead, a third naked figure sat by the side of the road, his head in his hands. I felt as if I'd arrived in a town of zombies. Apac's empty streets reinforced that impression. The town seemed to exist only for sickness and death: on one road I counted 12 medical centers, 10 drugstores and a crumbling, windowless nursing school. Soon I found a building that belonged to the Ministry of Health. I pulled in, entered and followed a dark corridor to a door marked "District Health Officer." I knocked. Behind two sets of fly screens and under a ceiling fan, Dr. Matthew Emer sat at his desk. I explained I was following a new campaign to rid the world of malaria and was in Apac to see what it was up against. Who were the naked men? I asked. "Brain damage," Dr. Matthew replied. "Severe malaria can do that to a baby. You never recover." Dr. Matthew thought I should see some statistics. Apac is home to 515,500 people. Between July 2008 and June 2009, 124,538 of them were treated for malaria. That meant 2,000 to 3,000 patients a week for Dr. Matthew and his three fellow doctors, and the number rose to 5,000 in the rainy season. Of Apac's malaria patients, nearly half were under 5. Signboards erected by the side of the road announced the presence of two foreign-assistance programs. One was a European-funded child-protection group, which had no malaria component to its program. The other was the National Wetlands Program (NWP), funded by Belgium. Partly because of NWP's influence, the draining of malarial swamps is banned  which amounts to preserving wetlands at the price of human life. Spraying houses with insecticide  which in 2008 cut malaria infections in half  is also forbidden. Why? Because of objections from Uganda's organic-cotton farmers, who supply Nike, H&M and Walmart's Baby George line. Chemical-free farming sounds like a great idea in the West, but the reality is that Baby Omara is dying so Baby George can wear organic. This, too often, is how aid goes: good intentions sidetracked by ignorance; a promising idea poorly executed; projects that are wasteful, self-regarding and sometimes corrupt. The people being helped often see things this way, as do the ones doing the helping, who ask why the hundreds of billions of dollars given to Africa since World War II have changed so little. 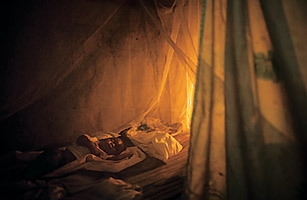 It was in the face of such controversy that in 2007 the aid world unveiled one of its most ambitious goals: eradicating malaria.